Lewis Hamilton believes Red Bull needs to give young drivers time to develop, following the switch of Daniil Kvyat and Max Verstappen for Formula 1’s Spanish Grand Prix. Red Bull, which is famously ruthless with its drivers, made the decision to promote Verstappen from Toro Rosso to its leading team, with Russian Kvyat moving in the opposite direction. When asked about the decision at Barcelona on Thursday, reigning world champion Hamilton said: “It’s a good opportunity for one and for the other very unfortunate. “Red Bull has done well in bringing young talent forwards but they need to be aware young drivers need time to progress. Mistakes do happen,” he said. “There is so much pressure on us, particularly at a young age; there is so much to learn and a lot of pressure on our shoulders. 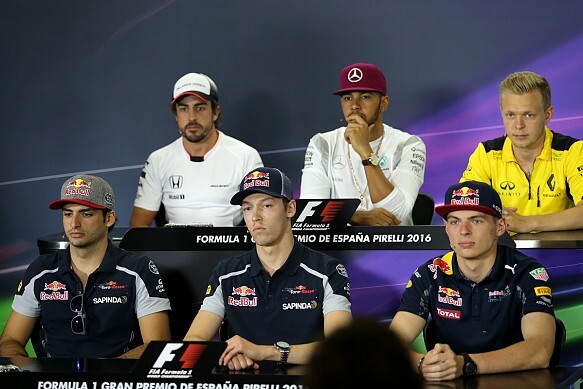 To take a driver out of a team where he is comfortable and move into another one, it’s a difficult position to be in. Fellow world champion Fernando Alonso admitted the news came as a shock, but he suggested it is difficult to question Red Bull’s methods given its success in pushing young drivers over the years. Romain Grosjean, who like Kvyat has experience of being under fire for causing incidents in the past, believes the decision was very tough on the Russian.